The fjord's hills are low at its north end, but grow as we paddle south. Most of us were up by 5:30 the next morning (July 25th). We needed to have breakfast and our last showers for a week out of the way so that we could help load boats and gear on the trailer for our trip to Cap Jaseur. 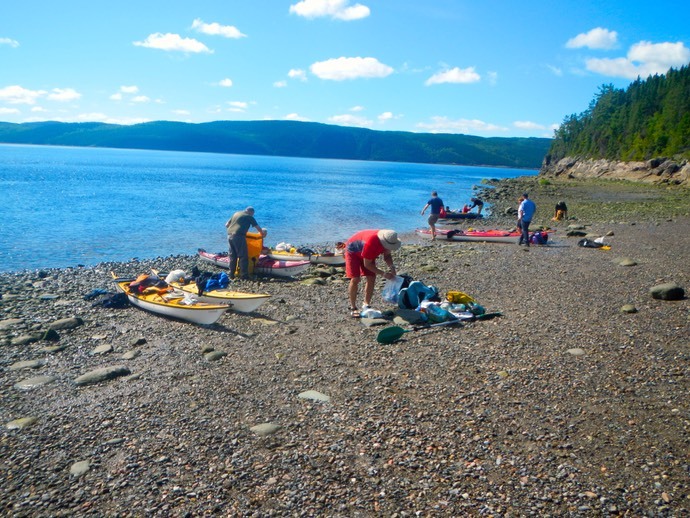 Florian, our guide, arrived at the cabin before 7 AM and we began to load boats and gear at once. Once the van was loaded we parked our cars out of the way and piled in for the trip to Cap Jaseur. It turned out to be a long ride. After about ninety minutes and the need to hunt for the road to Cap Jaseur, Florian headed down an impossibly narrow, rutted, steep and winding dirt road. He had to continue forward because there was no place wide enough to turn around and it would be impossible to back up. Finally we got to what passed as an office for the camping and cabin complex. After paying launch fees, a chain was dropped and we continued on down the impossible road till Florian felt he could go no further. From his stopping point to the "beach" was hundreds of downhill yards over which we must carry all of our boats and gear. The shortest route was down a flight of stairs to a flat place above the beach where we could stage our gear before a final carry to the water's edge. Once all the boats and gear were at the staging point above the beach we used a four man carry technique to get the boats the 150 yards or so down the remaining slope to the water. Then it was multiple trips back to the staging point to collect our bags of gear for loading into our boats. We consolidated empty bags we didn't want to carry with us and handed them off to Florian for safe keeping. I have no idea how he got back up that road. We finally got underway at 10:45 am. Despite the forecast of bad weather, the day was beautiful, with mild temperatures, low humidity, and just enough breeze to be refreshing. We saw our first lighthouse along this stretch and noted a large flat construction next to it that could only have been a helicopter landing pad. 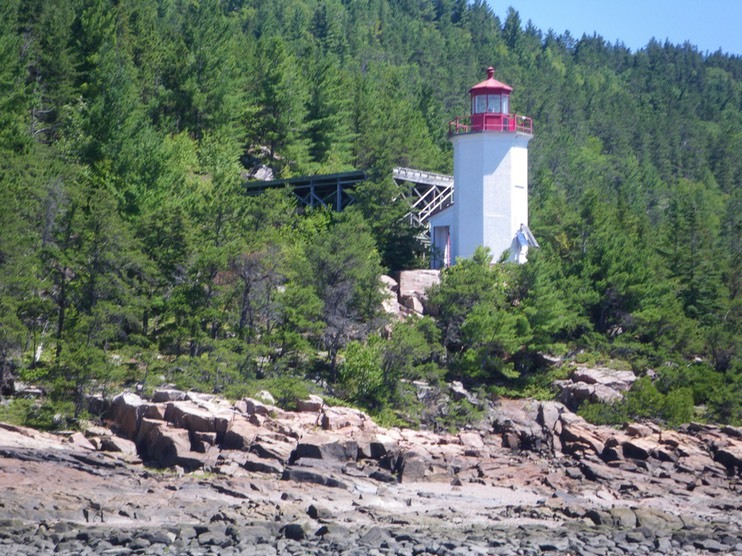 As days passed we noted that every lighthouse had a landing pad next to it. Apparently these sites are so rugged and remote that they can only be serviced by helicopter. The landing at Anse de Sable was pretty flat and only partially boulder strewn. However, arriving just after low tide, we had another enormous carry to get our boats and gear above the high tide mark. Then it was haul the camping gear up hill to the sleeping platforms. After all this, I was done in and beginning to feel my age. I pulled out my chair and sat for a while. Had something to eat and took time to recover before setting up camp. 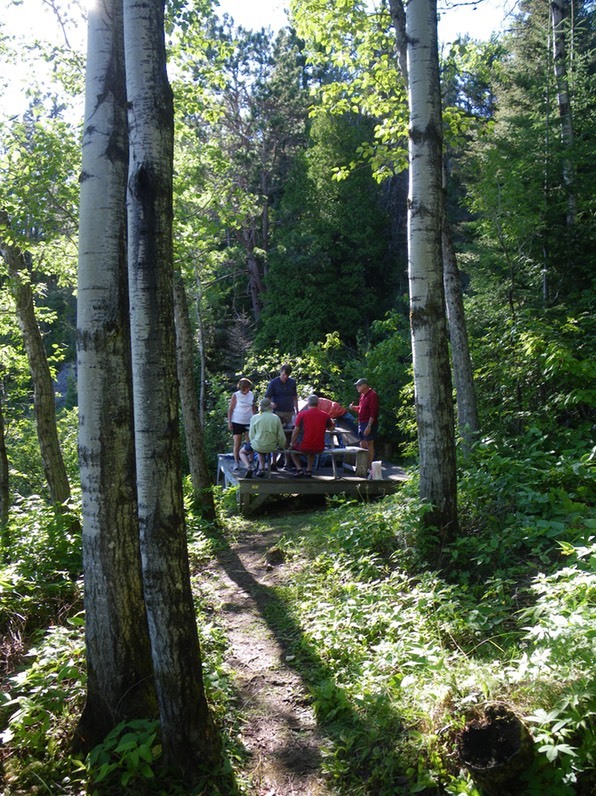 Dinner was on Robin and Kaare's tent platform where someone had placed the lone picnic table. Park officials usually like to keep food preparation and eating areas away from sleeping areas. However, this camp had a squatter who was poaching on one of our paid for sites. This squatter had apparently moved the picnic table to the platform below his tent. We ran into squatters on our first trip as well. This seems to be a problem in the park as the sites are remote and infrequently patrolled. Robin cooked pepper steak for dinner. By 7PM it was calm, cool and quiet - and the bugs came out! It wasn't long before we retreated to the safety of out tents.